How to Sync Music from iPhone to iTunes? 4 Easiest Ways! Sometimes trying to sync music from iPhone to iTunes can be a pain. If you try to sync your iPhone with a second computer, for example, it not only will often fail to transfer the data on your iPhone to the new computer, but it can also delete your music from your iPhone. This is particularly bothersome when you’ve bought a new computer and just want to sync your data. Because of this, it’s safer to use something other than iTunes to sync your music. Step 2: Connect your iPhone with USB cable. Step 3: Go to “Edit,” then “Preferences” on iTunes. Step 5: Find where it says “Prevent iPods, iPhones and iPads from syncing automatically” and click on the box next to it. If you use this method, remember that this will only transfer music that you purchased in the store. Some music freely downloaded on iPhone cannot be synced. Make it so it doesn’t matter if your iPhone is synced with another iTunes library! Step 1: Install iMyFone TunesMate, and connect your iPhone to your PC. Launch the TunesMate application. Step 2: Click “Home” tab, if you’re not there by default. Note: TunesMate does not limit only one iPhone to sync music to iTunes. You can enrich your music library from unlimited iDevices. In other words, you can share your music with friends. It can also transfer music to and from your computer and any iOS devices. It can help you convert the files while transferring. You can edit the music info of any song on your iPhone at will. It can also help you manage, create, and delete files, right from the convenience of a simple interface. It does not support ringtones now. But it will add it into its function soon. Basically any function that you will ever need when it comes to music on your iOS devices, TunesMate can handle it. 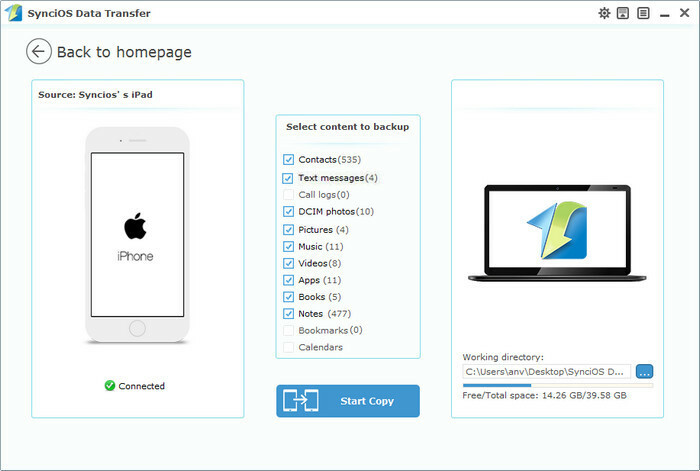 CopyTrans is a device manager similar to TunesMate, though its interface is not as smooth. 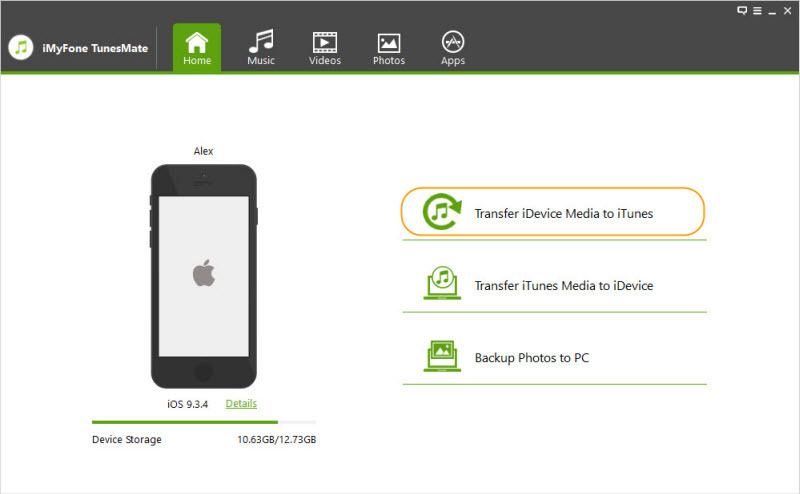 You can transfer files to your PC from your iPhone / iPad / iPod, as well as transfer from those iOS devices to your PC. You can also manage playlists and even add music to your iTunes library without having to open iTunes. It’s not as good as TunesMate, but it’s still a good option, and it will allow you to transfer music from your iPhone to iTunes like TunesMate does. It supports a large variety of iPhone files. You can back up your iPhone files to computer and download music to iPhone as well. It does not support to transfer music between different iOS devices. It might affect the function of iTunes playlists. SynciOS manager is yet another iOS device manager that gives you control over your iOS device in a way that iTunes can’t. Like TunesMate and CopyTrans, it can transfer your music from iPhone to iTunes and you never have to launch iTunes to do this, which makes it very easy. 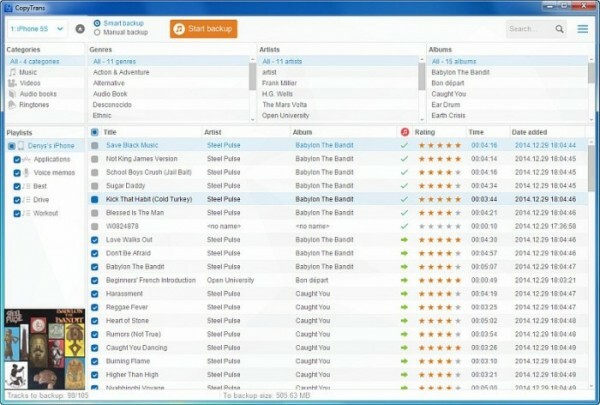 You can create or manage your playlists without messing up. It has a friendly interface to use. It helps you to back up your iPhone data to computer. It does not support to back up or transfer data for iOS 9 and later version. It may have the issue that the imported music on iPhone may be displayed.